Today, when you order "Pegasus", you'll instantly be emailed a Penguin Magic gift certificate. You can spend it on anything you like at Penguin, just like cash. Just complete your order as normal, and within seconds you'll get an email with your gift certificate. Borrow a spectator's ring and assure your volunteer that you will take attentive care of her precious jewelry. She drops her ring into a tiny black velour drawstring bag. In an instant, the bag and her ring vanish. Your hands are completely empty! 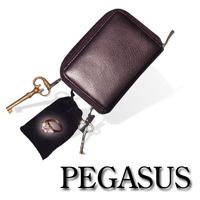 You cleanly remove your stylish leather zip-around key case from your back pocket and unzip it. There, dangling from its drawstring loop among the keys is the velour pouch, solidly locked onto a key clasp. You release the bag and hand it to your lovely spectator, who is amazed and relieved to find her ring inside! This is truly an impressive trick that will catch the spectator off-guard. Comes complete with leather key case, black velour bag, detailed colored instructions, and everything else necessary to perform this elegant and mind-blowing trick!